The last few weeks I have had the pleasure of starting to get to know my new year 10 GCSE group. They are an incredibly mixed bunch of young musicians and enter the course with from a range of backgrounds. To start the course I asked the students to complete a short questionnaire about their hopes and anxieties about the course as well as about their prior musical experience. When reading it I found a lot of the expected responses. Many took the course because they enjoyed it at key stage 3. All of them were looking forward to the practical elements of the course and building on their knowledge of a range of musical styles. But one answer stood out. In answer to the question ‘is there anything you are worried about on starting the course?’ at least 8 of the 15 students answered with the same single word. Composition. In another instance last week I was chatting to a year 10 girl who was telling me she was already regretting not taking music GCSE. I asked her why she didn’t and her answer was ‘I can’t compose’. The same girl performed a song she had written in a concert in the summer, which would easily have got an A or higher at GCSE. I was thrown by this. At key stage 3 our young musicians are composing at every corner of the curriculum, years 7 and 8s queue up to show us the music staff their new ideas for a yearly composition competition. We have concerts showcasing student compositions and pupils are keen to take part. So how come they don’t see themselves as composers at the end of year 9? I tried to unpack it with year 10 the following lesson. In discussion they said they were nervous mostly about two things: composing alone and having to produce notation. In many of their heads GCSE composing means working entirely on Sibelius and creating scores of music. Composing a song using a guitar and voice or composing using Cubase was, in their heads, of lesser value at key stage 4. Is there something I have done to instil this view or is it a wider issue? So here comes some thinking about composition at key stage 3. I have already have plans to map out progression in composition this year as part of a new assessment framework, but getting our young people to view themselves as musicians and young composers early on is vital. The use of student and teacher language is going to be a vital starting point. Comments and suggestions are very welcome. This entry was posted in Classroom Pedagogy on September 28, 2014 by LizGleed. On Wednesday night, like many others, I sat down to watch the new C4 offering ‘Don’t Stop The Music’. I have already read some very good responses online so thought I would offer mine. Throughout the programme I went through many emotions: horror upon watching the primary lesson taught by the non specialist in the least musical way possible. Then joy on watching the students faces light up on receiving an instrument. Confusion was next as to why on earth the children stood in a shopping mall miming playing paper instruments. Finally I was moved by one of the children proudly showing their parents their new instrument who in turn have possibly have never had an instrument themselves. The whole episode felt very noble and Rhodes is obviously very passionate about what he is doing. However I cannot get away from the fact that the premise is more than a little unnatural. I am finding out increasingly how variable music education is at primary level, but is the solution really to give our children an orchestral instrument? How is this sustainable in this context? If given an instrument then surely these students also need skilled expert teachers who can teach them good technique and ensure this is a skill they learn for life? Where are these teachers going to come from? The programme also implies that playing an orchestral instrument is key in music education. Yes it is an area of musicianship we must invest in properly with skilled teachers and good instruments, we have a scheme at our school where we do just that. But surely if Rhodes had consulted with any specialist primary music teachers on planning this programme he would have seen the benefit of singing and composition among many other things, including playing instruments such as guitars. For me it feels like the gimmickry is just too strong and that does not sit easily with me. The success I suppose will be judged in the longevity. As a secondary teacher I have been reflecting on my role in supporting our primary schools. It does seem that many primary teachers are nervous about teaching the subject and if we can empower them to teach music musically and work alongside more confident practictioners then surely this is the strongest start? Or is it a teacher training issue? I have done a fair amount of work in primary schools during my career and my mission is always to support the visited school in building up resources to be used again. I have been into a school in the past where the teacher was timetabled elsewhere to cover when I visited so I was left to do the music provision for them. This was a minority case, but was not a rewarding exercise for either side. Our hubs must realise their role in linking schools together and offering support both in terms of time and in training. At the risk of sitting on the fence a little too much I will tune in next week to see where it goes. In the meantime I am grateful to James Rhodes for putting the topic of music education out there into the wider arena. The viewing public are talking about how important the subject is for our children so that is a success. We need to value, promote and invest in this vital art for all children of all ages and keep this debate out there. This entry was posted in Classroom Pedagogy on September 14, 2014 by LizGleed. In this room, we make music…. So after much deliberating over the summer I have finally decided to ditch the formal centre tables in our large music classroom. Admittedly I had reservations, most of which revolved around managing note taking in listening lessons at key stage 4 and 5. But in the end the benefits of the new layout far outweighed them. The final moment of clarity for me came when I thought about the new year 7 intake and the first impression I wanted to give them of our department. I did not want our classroom to say ‘find a seat, put your bag on the floor and write the date in your book’,. Instead I wanted it to say ‘in this room, we make music.’ And so our tables have been put to the sides, the keyboards were laid out and I am armed with clapping games and songs as starter activities. 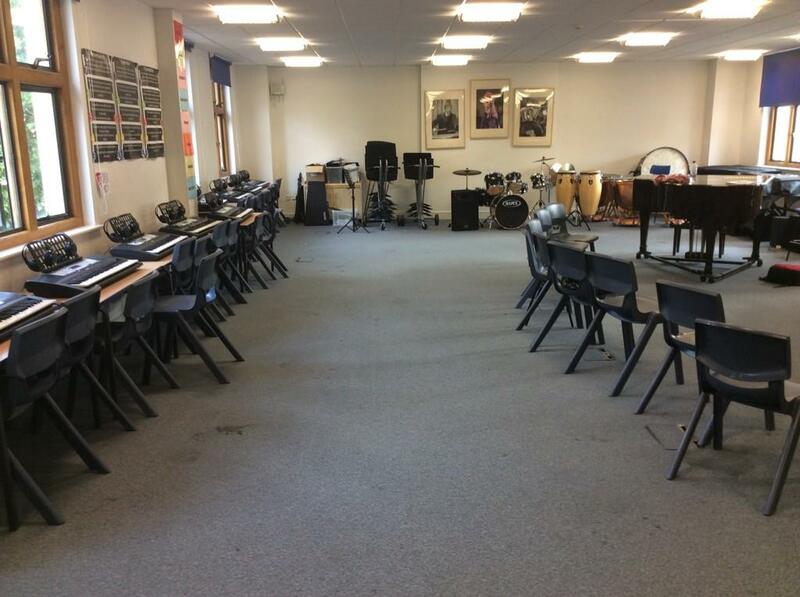 Tomorrow the room gets a solid test of constant key stage 3 classes with a mission to make music from the outset. This entry was posted in Classroom Pedagogy on September 7, 2014 by LizGleed. On Wednesday night I took part in the weekly #mufuchat and got to thinking about the fresh start I have before me in September. Despite the disappointment of the ending holiday break there is something quite exciting about the new academic year: new planner, new classes, fresh concert repertoire and meeting new colleagues and students. It presents itself as the perfect time to set some new year’s resolutions. So here are mine, a positive way to start my new blog! I always start with good intentions, but I want to make sure my classes are singing weekly, from year 7 to 13. Whether singing a song together, singing a perfect cadence to understand it or modelling ideas in composition I don’t want to forget to use this vital aural skill throughout my lessons. Too often I teach a year 12 set work with a lot of front heavy content without listening to it enough or appraise a student’s composition based on a strict criteria. If results are to be sustained and improved then I appreciate I cannot ignore the requirements, but I hope to manage them musically. Sometimes I need to remember my responsibility to introduce children to the world of music. We are in a unique position as music teachers to show our students the masterpieces within our art. So just like an English teacher inspires keen readers, I want to inspire keen listeners. I hope to blog on this a little more soon. I am hoping I can stick to these and use them as something to reflect on later in the coming term. This entry was posted in Classroom Pedagogy on August 31, 2014 by LizGleed.